Another Side of Poverty; Diamonds Are Forever? In America, poverty doesn't always involve lacking enough money to eat or to pay the bills. Poverty often is the experience of viewing the affluent society. Consider jewelry. A poor person, for lack of access, may covet gold or fine diamonds. "In the late 1800s, the Oppenheimer family established a diamond monopoly with its company, DuBeers. 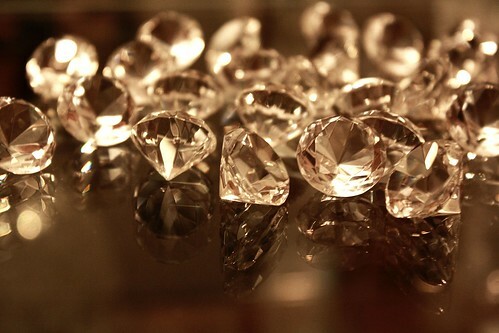 At the time, diamonds were practically worthless compared to other gems, but DuBeers set out to change that by limiting their supply, driving up the price. "In the 1930s .... DuBeers turned its focus to marketing. The company gave Hollywood starlets hefty stones, arranged glamour photo shoots, and script-doctored movies to include scenes of jewelry shopping. .... And DuBeers visited high schools to teach girls about the value of diamonds. "In 1947, DuBeers' ad agency came up with the massively successful slogan, '˜A diamond is forever,' which implied that diamonds don't crack, break, or lose value. They do, but it needn't have mattered. Thanks to clever marketing, the diamond came to symbolize true love and diamond rings became an inseparable part of courtship and marriage." One might logically ask, if all this is true, why would a poor person care about jewelry? As they used to call it when we were young and in school: Peer pressure. Sad, but true. 14.3 Percent Poverty Rate - Obama to Blame? We are hearing that the federal poverty rate of 14.3 percent in the highest since the 1960s. 1) Obama fought to extend unemployment benefits, but an individual who receives $300 still heads a family in poverty. $300 per week equals $15,000 per year. The federal poverty income is about $20,000 for a family of four. 2) Obama pushed to raise the minimum wage to $7.25 an hour. Anyone lucky enough to get full-time hours in the minimum wage economy still is bringing home a scant $290 per week .... again, below the poverty level. These folks may officially remain in poverty under Obama, but they would be in far worse shape if he had not been elected president. Health care legislation eventually will bring them into the system as well. 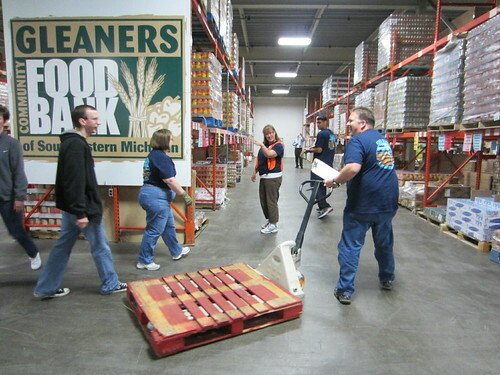 To feed the poor in Detroit, the Capuchin Soup Kitchen doesn't just look for cash and canned good donations. The 2-acre Earthworks urban farm that surrounds the soup kitchen facility provides plenty of fresh fruits and vegetables. Some of the 460-ton harvest goes on the plates of the soup kitchen's 100 daily patrons. Other portions of the produce are given to family's in need. Sales to support the project are made on site and at downtown's Eastern Market. 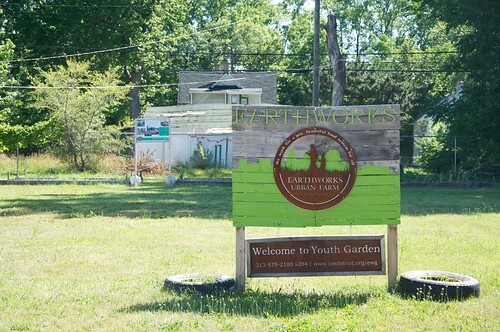 Earthworks expanded in 2001 and began working with the Wayne County Department of Heath, which oversees the federal Women Infant and Children (WIC) food program. One aspect of WIC is Project FRESH, which encourages parents to serve their children fresh fruits and vegetables rather than unhealthy fast food and snacks. 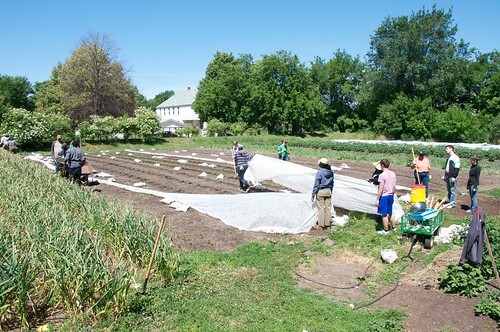 In this respect, produce from the Earthworks farm is helping to combat child obesity. To me, our resources are so totally wrongly directed. I want to go batty each time I visit the web site costofwar.com. I invite you to go look, the site will show you the costs of the Middle East war campaigns in our new millennium.The tragedy is all spelled out. The United States Congress has NOW authorized $47 billion to continue the warfare in Afghanistan and Iraq. Now, I have supported President Obama and maybe he knows something I don’t know, but there are 70 Democrats within the past year who have changed their minds. I probably should not even be citing dollar amounts, considering the overriding question of carnage, with so much killing and so many amputees and crippled children.. I believe President Obama may be making a measured judgment in perceiving that this horrible carnage is a necessary evil in preventing the more horrendous carnage that terrorists would inflict. He seems to be a good man, not just a good man but an outstanding leader who wants to serve for the common good. But when I think of the horror of warfare and violence, and when I take note that the United Nations estimates that a $30 billion annual investment could resolve global hunger, I have to give pause. 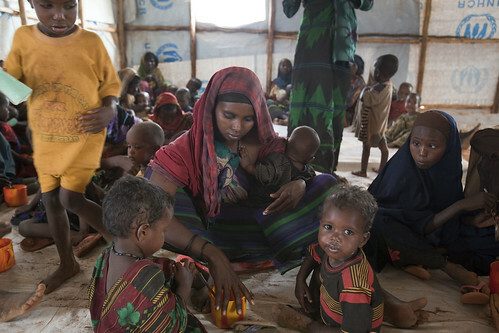 Hunger truly is a form of violence, and to address global poverty we must address hunger first. I only wish President Kennedy a half century ago would have decided that we don’t need to go to the moon, that we need to deal with global poverty and alternative energy, and the we needed to get out of Viet Nam. World Trade and Global Poverty: Check the Label, Please! Wal-Mart stores have been selling red-white-and-blue T-shirts that were especially popular prior to the Fourth of July. They display a map of the U.S.A., awkwardly patterned with the Stars & Stripes obliterating the Pacific Northwest. They are a real bargain at only $2, although they give an appearance that the map and the flag may fade quite quickly when washed, after all, the name of the manufacturer is “Faded Glory.” Is that a metaphor for how these sweat-shop cheap imports are contributing to global poverty? 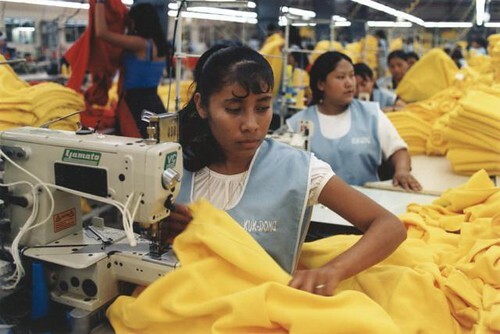 The shirts are made in Guatemala, by workers who earn an average of 53 cents an hour. According to the organization Globalization and the Poor, average Third World hourly wages for apparel workers are 13 cents in Bangladesh, 26 cents in Vietnam, 34 cents in Indonesia, 44 cents in China, 49 cents in Haiti, and 75 cents in Nicaragua. This makes average pay in places like El Salvador ($1.38) and the Dominican Republic ($1.62) seem downright lucrative. Some globalization apologists argue that U.S. companies actually are paying more than domestic manufacturers in the Third World, and that if the Americans were to pull out, global poverty would become even more severe. There’s a solution, according the group Global Watch – an international minimum wage. All sorts of trade agreements are governed under the World Trade Organization. Why not this? And the next time you see an item or a product that displays a U.S. flag, check the label! 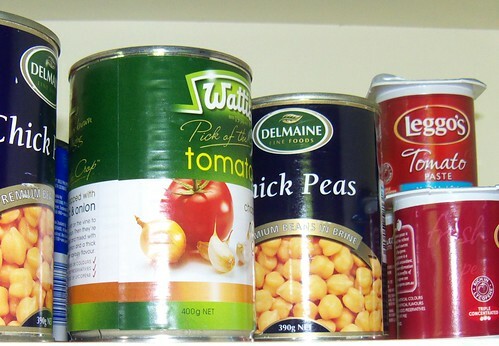 Which Donation Stretches Further: Canned Foods or Cash? A local food pantry announced a fund-raiser, or generates publicity because in hard times, they are running out of food. So with your helping heart, you head for the supermarket, purchase a tray of canned string beans, and haul them to the pantry. You could have just given them the money you spent. Leader of Feeding America, formerly America's Second Harvest, explains that regional food operations that support local pantries can transform a $1 gift into $15 worth of food. This is accomplished by obtaining surplus food from the government, or from brand-name companies. If Kellogg's produces more boxes of corn flakes than Kellogg's can sell, for example, the surplus is obtained by the Feeding America operation. 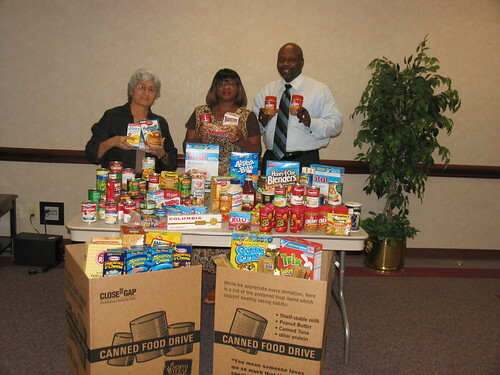 Food pantries always welcome donations of canned goods and other perishable items. Your thoughts are what count. Just don't get any false impressions that you are selling them short by giving cash. Actually, you are selling them long.